Over a year ago, I had visited the original Hapa Izakaya and it turned out to be a great meal. Mind you, Costanza and Snake weren't really there for the food... Ah yes, Hapa is one of those places where the scenery can be equally as appealing as the food. But honestly, I really am only interested in the food, no joke! And no, it's not because Viv reads my blog either. Tonight after Friday night hockey, Milhouse and I met up with Lionel Hutz and Truditini at the Robson location. There were several reasons for my return visit. First, I love Izakaya and I rarely turn it down, even if I've been to that restaurant before. Second, if you've noticed, I'm beginning to revisit some restaurants as an update of sorts. Third, my pictures on the original visit sucked. And four, my visit to the Yaletown Hapa was a bit average of sorts (time to see if the original can make it up). Initially, there would've been other people joining us; but once they heard Downtown, they all bailed. Oh c'mon guys! It's not that far and parking isn't that hard to find at this time of night. Lack of dedication to food, how very, very sad... Well, luck would have it, I did get a parking spot nearby, right in front of Gyoza King in fact. Hmmm... I should pay a return visit to here too! Since Lionel arrived earlier, we didn't have to wait and got seated right away. I'm not sure if we were really all that hungry; but at any place that serves shareable food, we often order too much. I think in the end, we got a total of 10 dishes for 4 people. 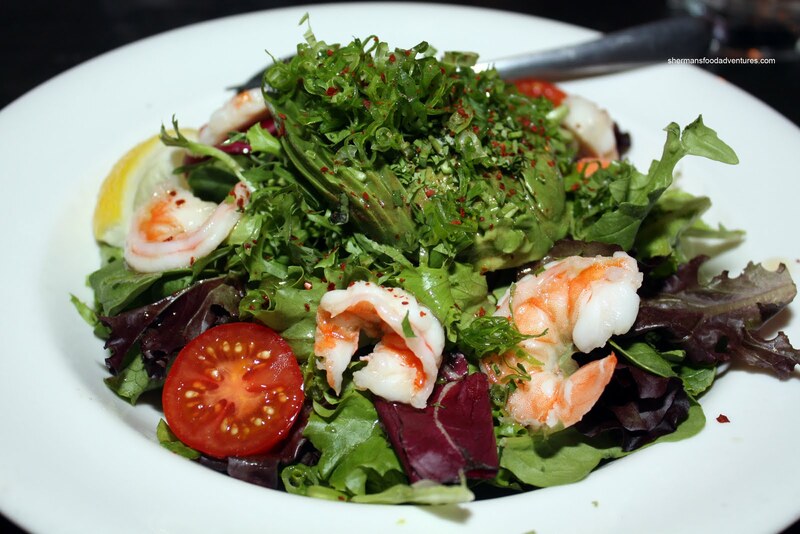 We started with the Ebi Avocado Salad. Topped with an obscene amount of green onion atop soft avocado and mesclun greens, there were crunchy ebi swimming (very punny...) throughout. We enjoyed the salad, it was large, had just enough dressing and the ingredients were fresh. 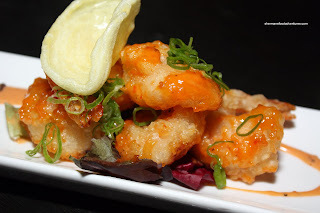 One of my favourite items at any Izakaya is the Ebi Mayo. Last time at the Yaletown location, the batter was a bit gummy. I was very happy to see that this version was much better. Crisp, like it should be, and only moderately dressed with chili mayo, these rocked. Went really well with my Asashi Black. Well, it also went with the sake that Lionel ordered also... You see, I already had quite a few cocktails from the Foodie Tour earlier in the evening. I think my liver was wondering what it did wrong to deserve that kind of treatment... Anyways, Milhouse really wanted to try the Gyoza. We warned him that this was no ordinary dumpling. Rather, it is filling sandwiched in between 2 thinly sliced pieces of lotus root, battered and deep-fried. I personally am not a fan of this take on gyoza. It appeared that Milhouse was not either. I'm sure some people like the different textures at play here; however, we are not one of them. I'm not sure who ordered the Tuna Carpaccio; but whenever we get this, it is definitely quality over quantity (at least we hope so). 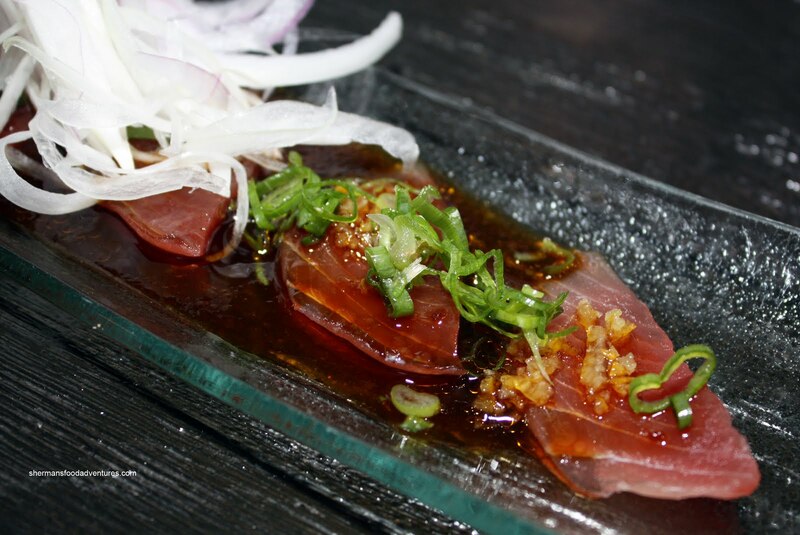 We ended up with thinly-sliced Ahi tuna with a slighty spicy ponzu dressing. I liked that it was not some vinaigrette (which some places use) since it just tastes non-Izakaya-ish. Not that it can't be good, I just prefer ponzu instead. Something about the tartness which goes well with raw slices of fish. We then went from yummy and small to yummy and meaty. Milhouse was very happy to see the Beef Short Ribs. He's a meat man and the tuna carpaccio was not enough meat in his eyes. 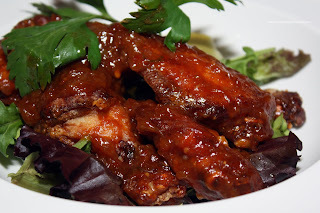 With nice char marks and being tender, these ribs hit the spot. I particularly liked that they were meaty without being fatty. Some have so much fat, there isn't much else to eat. 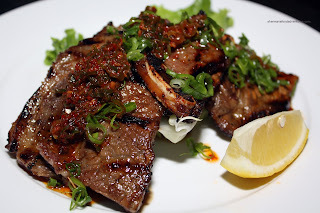 Also, the ribs were marinated just enough to provide flavour without taking away from the natural meat taste. 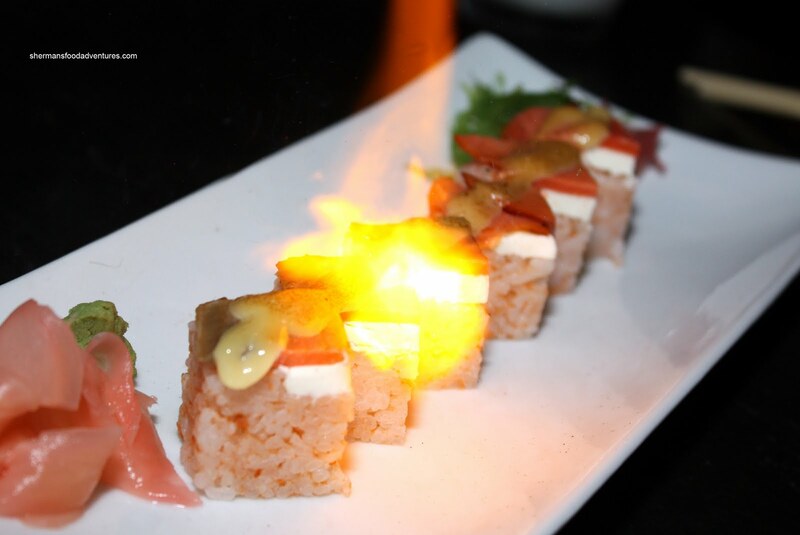 As if our recent visit to Miku was not enough to satisfy our Aburi Sushi quotient, Lionel chose the Aburi Salmon. By virtue of trying the Aburi Salmon Oshi at Miku just the night before, the version here was pretty average. Appearing quite small comparatively and topped with only a modest amount of sauce, there was both a lack of flavour and texture. I thought the pressed sushi rice to be a bit too dense. 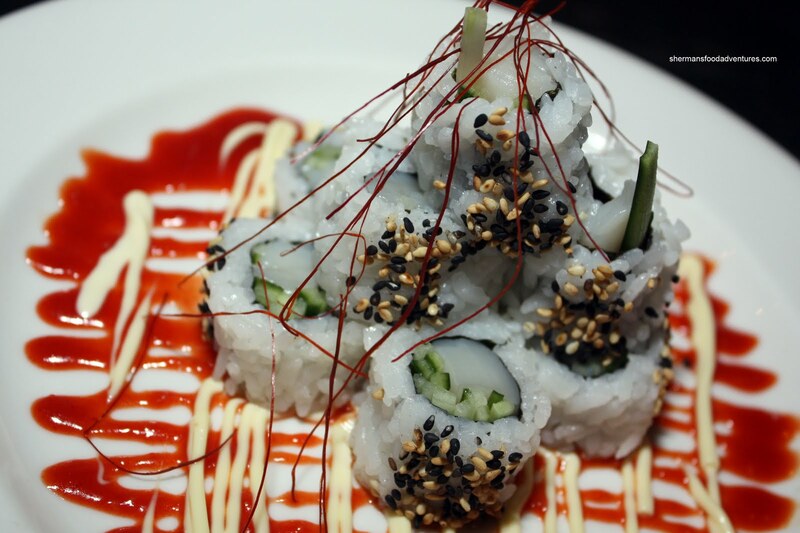 Although Hapa is not known for its sushi, we went ahead and ordered the Spicy Scallop Roll anyways. Presented in a very artistic manner resting on a spicy miso sauce, we quite liked it. Nothing amazing; yet it was very pleasant to eat. The spicy sauce was actually quite mild and didn't interfere with the natural sweetness of the scallops. The toasted sesame seeds added a nice nuttiness as well. We got an order of the Habenaro Wings just for the heck of it. Despite the threat of spiciness, the sauce was actually mild with only a slight kick at the end. I liked the slight smokiness from the sauce itself. Furthermore, the wings still were quite most on the inside. On our original order, Lionel wanted to get the Bin Toro, which we forgot. So, he made sure to get it before last call. Luckily we did, it was pretty good. 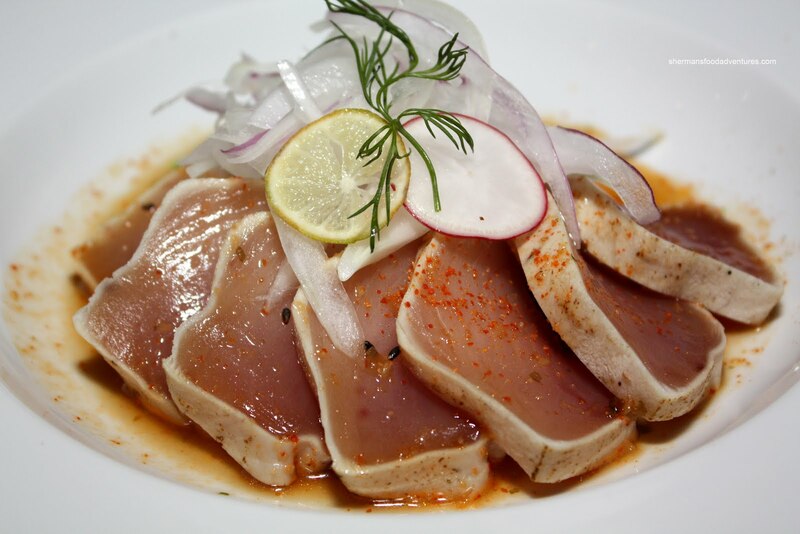 It's simply seared Albacore tuna dressed in ponzu. Sometimes simple is best when it comes to food. This was both straight-forward and delicious. Rounding out our dishes was the Katsuo Tataki. 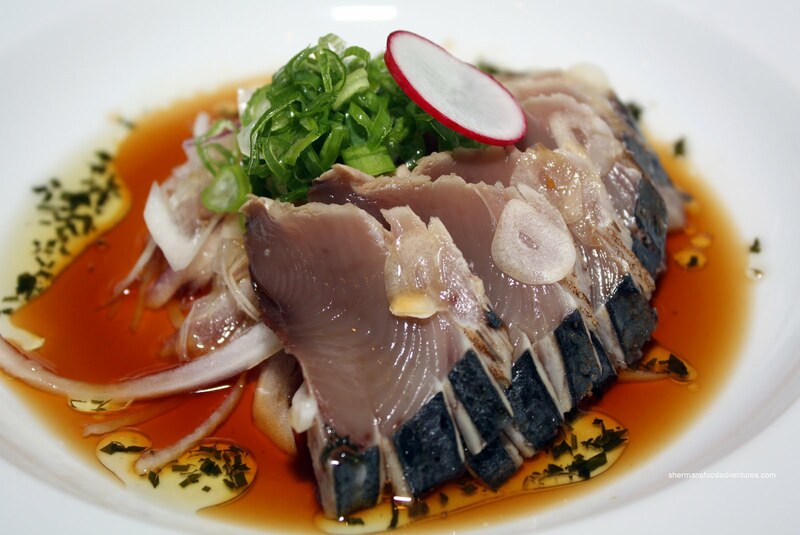 It is essentially Skipjack Tuna or very similar to dried Bonito flakes (which is used to make dashi). As such, you can imagine the flavour profile is much different than the mild tasting albacore tuna. Thus, when we were eating it, there was a pronounced fishiness to it. This was served with ponzu sauce as well. It turned out to be a nice contrast to the Bin Toro. It was nice to eat at Hapa on top of its game. Of course, when I visited the Yaletown location, it was quite new and some of the kinks were still being worked out. Thus, it probably warrants a revisit. Yet, for this meal at the Robson location, it once again reminds me that the food is solid and quite predictable. Price-wise, it falls somewhere in between Guu and Kingyo. For Lionel Hutz, that doesn't really matter since he prefers the scenery first and foremost. 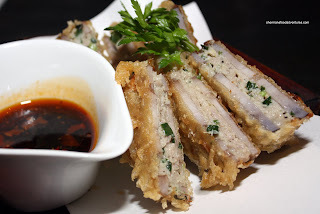 - Pricier than Guu and Gyoza King, is it better? Depends on who you talk to. Ebi mayo is my favourite too. I'm glad you're doing revisits--it's good to see what the consistency is with our restaurants. My first instincts usually turn out to be correct, though, and I tend to go to the same places a lot. I would never be a very good food critic! Hi Sherman, you must be one financially well-off man to be able to eat lavishly everyday :) Just wondering if you or your wife ever cook at home? Hehe! Darina, Ebi Mayo rocks! Hehe. Yes, revisting is a good idea... when it's not Tojo's, Bishop's or Cioppino's... $$$! Hi Sherman, your blogs are great. I've been going through a lot of your previous ones to try and catch up on your adventures. I'm confused about today's blog on Hapa though. I remember reading this exact same entry already (not sure if it was something you had posted recently or in the past). Why is it being reissued again? I don't think there's been any changes to it since I last read it. LOL Oil, actually I accidentally posted it 2 days ago. I took it off when I noticed the mistake. Thus, you probably have read it before! Thanks for the kind comments though!